Properties in Ferguson Township average 4.9 out of 5 stars. Farm cottage for football/graduation weekends. Property 1: Farm cottage for football/graduation weekends. Property 7: NEW! State College Home - 3 Mi to Penn St & DT! Charming Home For PSU Weekends - Conveniently Located Near Everything! Property 10: Charming Home For PSU Weekends - Conveniently Located Near Everything! Perfect home away from home for PSU football weekends! Property 19: Perfect home away from home for PSU football weekends! Property 20: Recently Renovated Private Suite! Penn State ALL Events rental 12 minutes from the stadium. Property 28: Penn State ALL Events rental 12 minutes from the stadium. 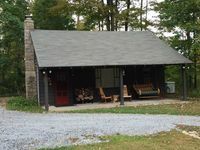 Beautiful, tranquil cottage on private lake located 14 mls from State College. Property 34: Beautiful, tranquil cottage on private lake located 14 mls from State College. Property 40: Completely Remodeled, Updated, Perfect Location Next to Downtown/PSU! 4.5 miles from beaver stadium! Property 43: 4.5 miles from beaver stadium! Beautiful Home On 5 Secluded Acres Near Beaver Stadium! Property 48: Beautiful Home On 5 Secluded Acres Near Beaver Stadium! This is the second time we've stayed here and, once again, our family had such a positive experience. The house is clean, has everything you need, and even includes a small welcome basket that just adds an extra personal touch and welcoming feel. We have three generations stay together when we come up and there is room for everyone to have their own space, while still being cozy enough to spend quality time together. The host is accessible, friendly, and a pleasure to work with. Can't wait to stay here again next year!